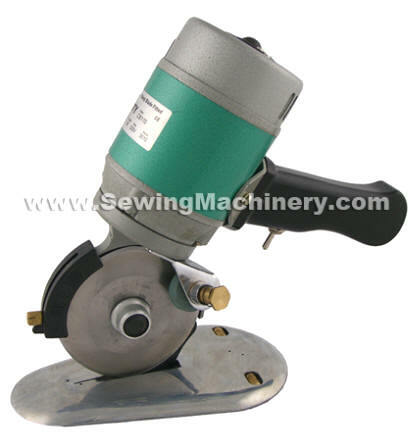 Unity CB110 industrial round knife cloth cutting machine fitted with 110mm blade and carbide counter blade for scissor like precision cutting. This general purpose cloth cutting machine is mounted on a shaped roller base for use with many materials including: cloth, leather, polymer sheeting, insulation, padding, neoprene sheets, filters, synthetic fibres, technical fabrics, trimmings, upholstery etc. The 110mm round knife blade allows a maximum cutting capacity of up-to 35mm*. 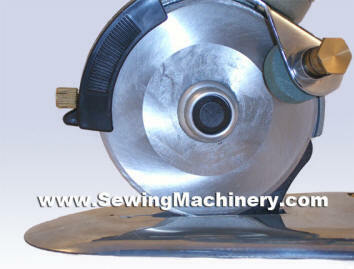 A four sided blade for general fabrics is included and optional blades are available. A powerful 180w electric motor is fitted with-in the robust metal housing. The machine has a built in blade sharpening system, using replaceable emery stones, and an enclosed gear greasing cup to ensure the gears are kept lubricated. Built-in one touch emery stone blade sharpener. Shaped base plate with inset rollers. Up-to 35mm maximum cutting capacity subject to material. *Cutting capacity subject to materials used.